Asia Pacific Sacred Heart Educators’ Conference. The faculty and staff of the International School were joined by sixty Sacred Heart colleagues from six sister schools in Japan, also schools and missions in India, Korea, Taiwan, Vietnam, Indonesia and Australia. Excited conversations and much laughter at the pre-conference dinner made it abundantly clear that in no time, our Sacred Heart bonds made strangers feel like old friends. 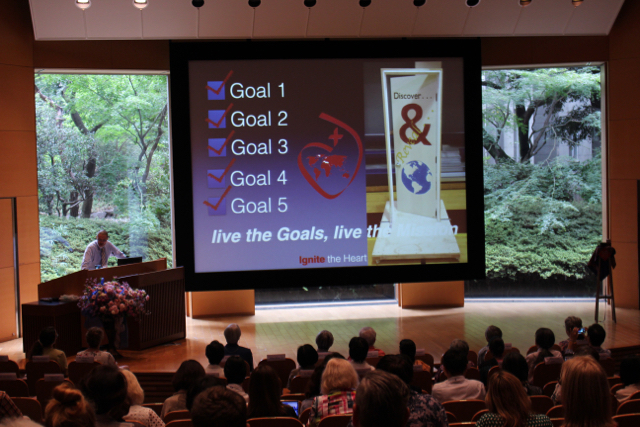 Inspired by the 2015 Roots That Give Us Wings conference in St. Charles, USA, the conference organizers invited Sister Kathleen Hughes from the USA-Canada Province and Mr. Sergio Vasquez, former High School Theology and Spiritual Life Director at the Convent and Stuart Hall, Schools of the Sacred Heart, San Francisco, to present in Tokyo to 127 conference attendees from twenty countries. The theme: Ignite the Heart: For the Sake of One Child focused conversation on the legacy of the founding mothers, Saint Madeleine Sophie Barat and St. Rose Philippine Duchesne. 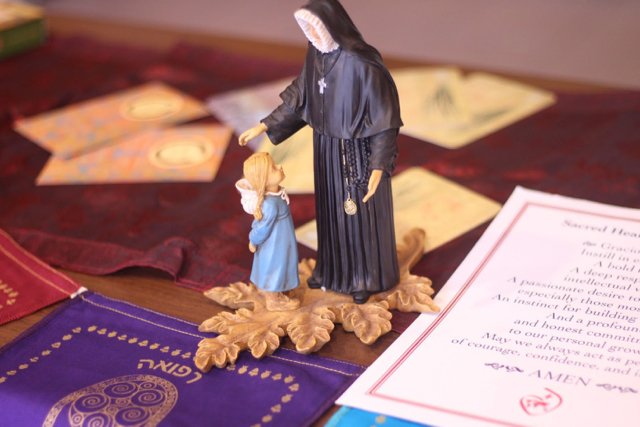 The gathering provided each participant the opportunity to share ideas about what it means to be a Sacred Heart educator in today’s world, and come away with a deeper understanding of the role of a Sacred Heart educator. So we must remember that it is better to begin a great work than to finish a small one.... the work in the rough.... may look ugly and yet be full of promise.... A piece of finished insignificance is no true success.... Our education is not meant to turn the children out small and finished, but seriously begun on a wide-basis. Therefore they must leave us with some self-knowledge, some energy, some purpose... If they leave us without these three things they drift with the stream of life. 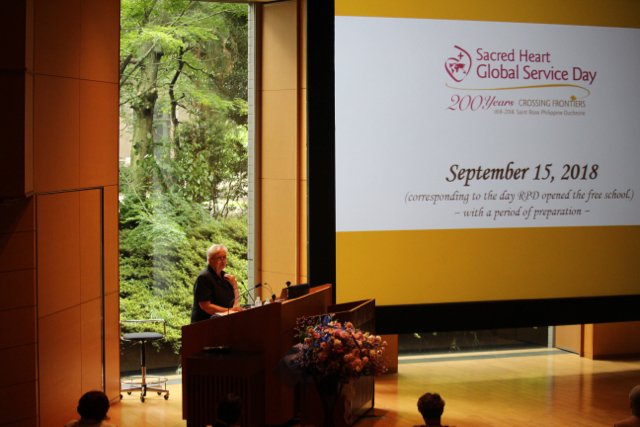 Sister Kathleen Hughes delivered her keynote speech on Images of the Sacred Heart – To be God’s Heart on Earth. The auditorium fell silent, awestruck by the rich diversity of assimilation of cultures and ages, depicting images of the Sacred Heart. Sister Kathleen urged educators of the Sacred Heart to be Christ’s heart on earth, and show love to the students in our care. She led the attendees in Visio Divina, Praying with Art, which teachers can do with their students. Filled with abundant energy, Sister Kathleen also presented on the Philippine Duchesne bi-centennial, which celebrates the arrival of five religious of the Sacred Heart in America, the anniversary of the US Province, Sacred Heart education in the Americas, and the 200th anniversary of the internationality of the Society of the Sacred Heart. The wonderful resources she shared will definitely find their way into classrooms across the Asia Pacific region. Sergio Vasquez, who presented the keynote on Friday morning, set the stage for his talk with wonderful displays showing universal ideas that religions of the world have in common. In Our Educational Mission in Action Today: An Invitation participants could choose which of the five goals they felt most connected to, and joined a group for a discussion around that goal. In their groups, they brainstormed what their schools do collectively and what they do individually to address the criteria in that particular Sacred Heart goal. Each group reported back and could learn about the goal they felt resonated the least within them. 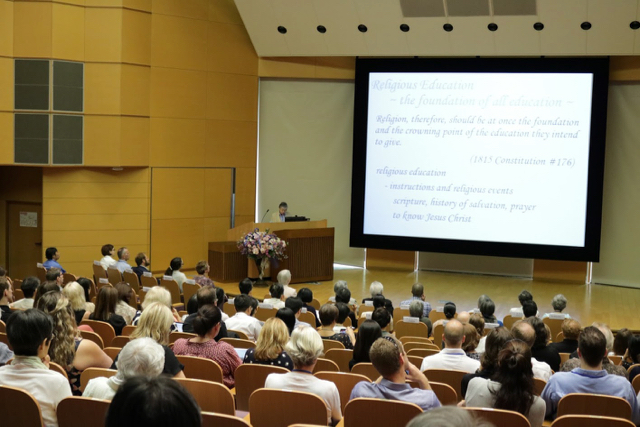 Other presentations covered a wide range of topics, such as a thought provoking talk by Pastor Ivan Martinez from Tokyo Union Church on the question of 'What Shapes our Spirituality?' In a dynamic presentation by Ms. Hilary Johnston-Croke from Kincoppal-Rose bay, Sydney, she reflected on her 12+ years as Head of a Sacred Heart school. More highlights were presentations by two rscjs from Japan: Sister Masako Egawa, who talked about the ongoing efforts to support those affected by the March 2011 triple disaster of earthquake, tsunami and nuclear meltdown in Japan, and Sister Ikuko Horiguchi, Provincial Archivist and Historian in Japan, who gave a fascinating account of the history of the Sacred Heart network as it spread from France to the United States, Australia, Japan and beyond. We learnt that we are standing on the shoulders of visionaries, whom we can look to for inspiration as role models of women of courage and confidence. Active participation was encouraged, therefore conference attendees took part in discussions of readings on topics such as Transformative Education, The Culture of Sacred Heart schools, Madeleine Sophie’s View of Education and others, in addition to a panel discussion about the Goals: how we live them, and what more can be done. All of these gave food for thought to individual teachers as well as schools, while we were learning from each other. The International School of the Sacred Heart prides itself on being a vibrant artistic community and the conference was a wonderful outlet for students and faculty to express their creativity. The Creative and Performing Arts department ensured that each conference guest left with a souvenir ceramics bowl with a decal of Philippine Duchesne. With much laughter and enjoyment, delegations collaborated on a commemorative art project where each team did a water colour painting on a woodblock-print-inspired linoleum. A magnificent work of art which gives a visual representation of the first four religious of the Sacred Heart who came to Japan from Australia in 1908 was commissioned especially for the conference. This piece will go on permanent display at the International School. A gallery of informative posters from participating schools or missions further enlightened the community about the work that occurs at our network schools. 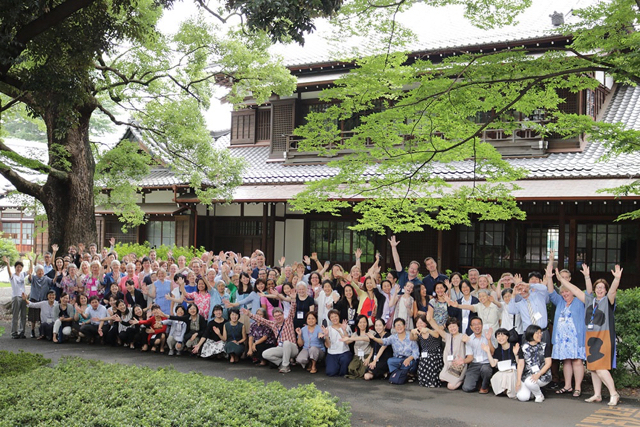 As if that wasn’t enough, during breaks in the conference, participants were able to visit the beautifully restored historical Palace on the Hiroo, Tokyo campus shared by the University of the Sacred Heart and the International School. Time to be still and reflect upon the learnings of the conference was integral to the two-day schedule. Espacio was not only something to be considered in theory, but also something to be experienced in practice. The closing event was a Prayer Service by Father William Grimm in the Sacred Heart campus chapel, where quotes from the founding mothers were shared as part of the service. Conversations about all the ideas that were exchanged the first day extended over delicious food at the Gala Dinner on the first night, at the Cheese and Wine on the second evening, and long after! In a continuation of the strong Sacred Heart bonds established during the conference, the day after the conference, guests from out of town could enjoy the warm hospitality of Fuji Sacred Heart and Sacred Heart Tokyo on optional tours.